A couple of weekends ago, youth from Jewish Youth for Community Action (JYCA for short) canvassed with a multiracial, intergenerational and mixed class group of about 100 community members from synagogues and mosques all over the region, including our very own Kehilla. 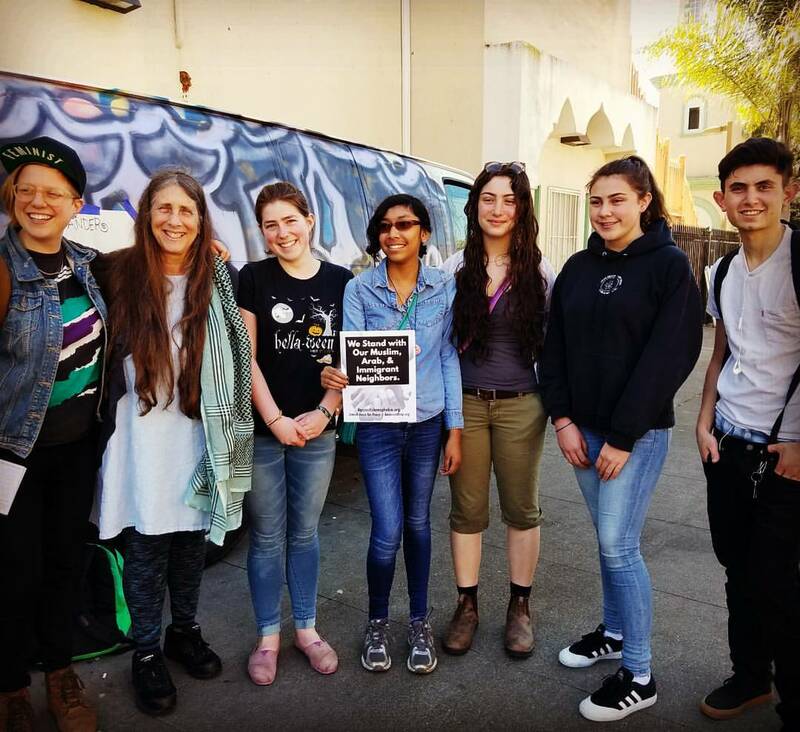 They attended a non-violent intervention training with Rabbi Lynn Gottlieb to learn how to interrupt instances of Islamophobia and racism that they witness, and participated in a training with Penny Rosenwasser about how to talk with neighbors about racism, Islamophobia and anti-Semitism. 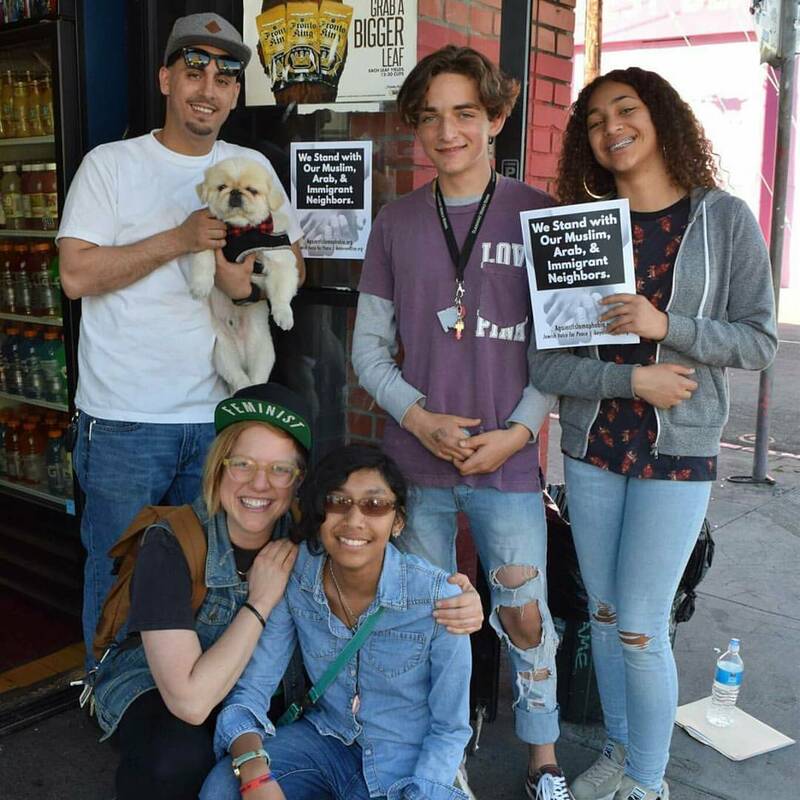 They then spent the afternoon connecting with neighbors and shopkeepers all over Oakland, many of them immigrants themselves, about the importance of living in solidarity with immigrants, communities of color and Muslims against hate and violence. They asked neighbors to put signs in their windows saying “We stand with our Muslim, Arab and Immigrant neighbors.” As they canvassed up and down Telegraph Avenue in Oakland they met many neighbors who were moved and grateful to have people in the community raising consciousness about solidarity with oppressed communities. 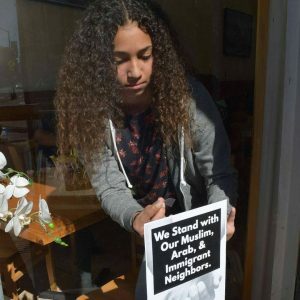 In one beautiful moment, an older Ethiopian woman who hardly spoke English ran after the youth down the street after her customer translated the message of the sign for her, crying and asking for one. At the end of the day we came together at Lighthouse Mosque in Oakland with all of the canvassers for an interfaith celebration of our connections, political resistance and resilience. Youth were powerful, eloquent and open-hearted. JYCA youth expressed appreciating being in intergenerational community working together to resist Islamophobia, and adults seemed to be heart warmed by getting to work together with the youth. 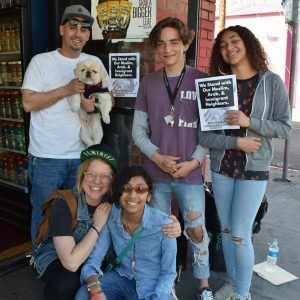 I felt so filled by this day, and by the profound ways in which I felt Jewish – with youth and Kehilla members, in a Mosque, with our immigrant neighbors, praying with our feet.